In 1998, four years after the Guerrilla Girls hit the streets of SoHo to protest gender inequality in the arts, word got back to the band of babes that they were being a bunch of whiners. People felt they were a bunch of Debbie Downers out on the streets complaining about one thing or another. What was it? Oh yeah, just women’s equality, no biggie. As i was saying, not wanting to upset people further, the Guerrilla Girls decided to take this message to heart and make art about something more positive. And thus The Advantages of Being a Woman Artist was born! 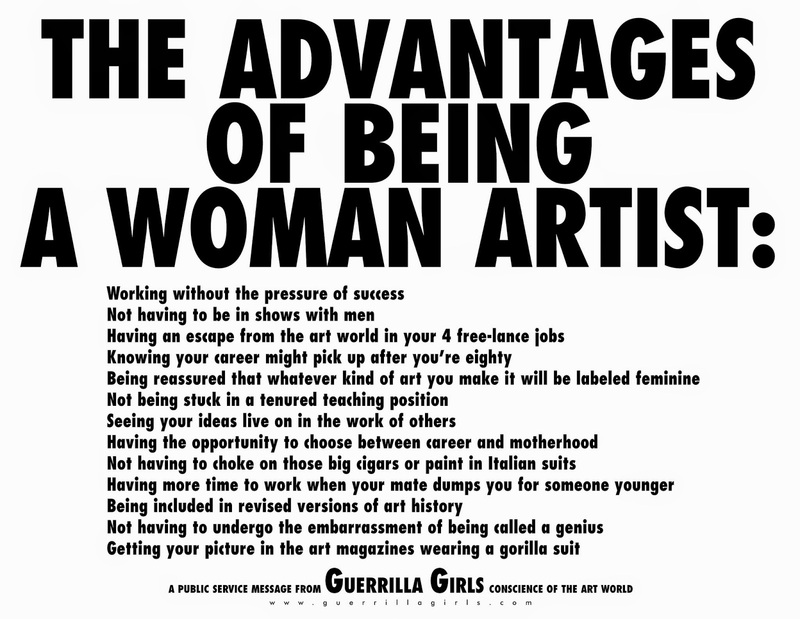 Reppin' some really solid points such as “working without the pressure of success” or “being included in revised versions of art history books”, the Guerrilla Girls proved to the world that they can see the bright side of things. I mean, isn't being acknowledged for your achievements a little overrated? Sure, they may be a little preachy at times (I mean, they did dub themselves the “conscience of the art world”), but the uneven representation in the arts that they fight against is a very real problem. The formation of the Guerrilla Girls in 1984 was in direct response to an exhibition at the MoMA entitled International Survey of Painting and Sculpture. The exhibition included 169 artists, only 10% of which were female. Pretty bleak numbers. Understandably, a handful of females were not too pleased with this one and decided to don their monkey masks and fight back using advertising aesthetics, statistics, and a whole lotta vandalism. Since their inception, they have broadened their scope of criticism to include topics such as corruption in politics, film, and pop culture. This poster remains one of their most well known works, largely due to how it resonates with female artists. Shortly after slapping these babies all over New York, a prominent female sculptor was so moved by it that she sent the Guerrilla Girls a check for $1,000 so that they could run it as an ad in ARTNews magazine. Now they sell this work as posters, on t-shirts, you name it.